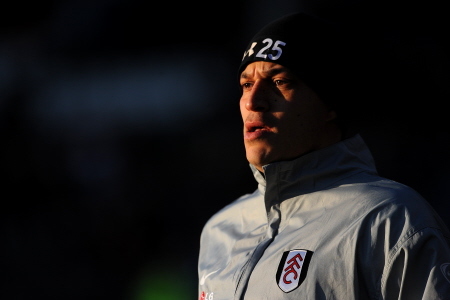 After taking the helm at West Ham yesterday, David Sullivan and David Gold have already set their sights on bringing Bobby Zamora back to Upton Park, just 18 months after the striker left for Fulham. The new owners have outlined the positions that need strengthening in The Hammer’s squad and have made £15 million available to do so – with a new centre forward being the top priority. Sullivan and Gold have targeted local boy Zamora as they are keen to reintroduce an ‘East End’ feel to the club (reports that Barbara Windsor and Ronnie Kray are also on the pair’s wish list are unconfirmed). The Fulham target man has been in the best form of his career this season after contributing 11 goals and a bagful of assists to The Cottager’s cause and I don’t imagine for a minute that Roy Hodgson would be willing to let him go anywhere. Should any prospective deal for Zamora fall through, West Ham have also targeted not-so-local boy Jo who is currently on loan at Everton from Manchester City. The Brazilian has fallen out of favour at Goodison after absconding to his homeland over Christmas without permission and The Hammers are keen to take up the last six months of the 21 year old’s loan deal.